During World War II, almost everyone that could serve, did serve, and wanted to serve. You could decide to enlist, or if not, the government could decide for you by drafting you. I enlisted in the Navy’s V-12 program which then took me to the USNR Midshipmen’s School in New York City for commissioning. My brother, George Brooks Curlee, served as a Sergeant in the Army’s 70th Infantry Division (Trailblazers), in Germany during World War II. He was wounded and MIA but made it safely home after the war. While attending the V-12 program at Tulane University in New Orleans, LA, I received the remaining hours I needed to graduate from Alabama Polytechnic Institute (now Auburn University) with a degree in mechanical engineering. 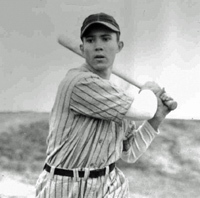 While I was at API, I played varsity baseball for three years. When I went to the USNR Midshipmen’s School in New York City, I focused on becoming an engineering officer. I was then sent to the diesel engineering school in Flint, MI. After that, I was assigned as the engineering officer aboard USS LST-78 for the entire time I was in the South Pacific and assisted in its decommissioning upon return to the United States. I was then sent to NAS Green Cove Springs, FL, where I assisted in decommissioning the USS Stern (DE 187). 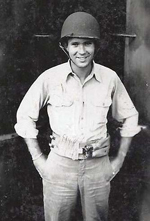 As the engineering officer aboard USS LST-78, I participated in the Okinawa Gunto operation, which was the amphibious landing, assault and occupation of Okinawa, during May and June 1945. It was also called Operation Iceberg. 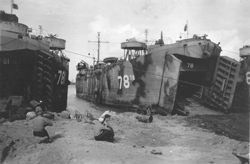 Photo is of our ship on a beach after offloading troops and equipment. We saw the USS Birmingham (CL-62) get hit by a Japanese kamikaze plane on May 4, 1945 off Okinawa. The plane hit her starboard deck forward, carrying a 500 lb. bomb which penetrated to the sick bay three levels below deck before exploding. 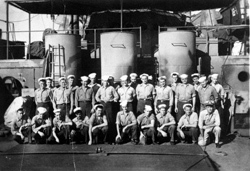 About fifty crew members were killed in the attack. The plane’s pilot was found dead in the water, having been ejected from the aircraft. She was able to steam to Pearl Harbor for repairs. It was terrible to witness such an event. Historian’s Notes: Following the Japanese attacking on Pearl Harbor and the loss of many American held Pacific outposts, the United States launched a counter-offensive strike known as “island-hopping.” The idea was to capture certain key islands, one after another, until Japan came within range of American bombers. The final island in this strategy was Okinawa and capturing the four airfields on the island that America needed to launch bombing raids on Japan’s industrial heartland and to use the island itself as a base of operations for the planned invasion of Japanese mainland. 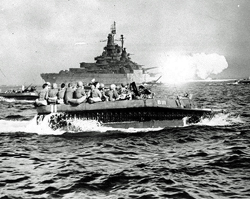 The invasion of Okinawa on April 1, 1945, the largest amphibious assault in the Pacific War of World War II began and ended with the heaviest concentration of naval gunfire ever used to support an amphibious landing. Positioned off the beaches were ten American battleships, nine cruisers, 23 destroyers and destroyer escorts, and 117 rocket gunboats. Together they fired 3,800 tons of shells at Okinawa during the first 24 hours. The landing force consisted of 60,000 American troops (two Marine divisions and two Army divisions). Initially they landed unopposed but as the force moved inland they found 130,000 Japanese dug into caves and tunnels on the high ground away from the beaches. They had been told by their commanding general to fight to the death. My only shipboard assignment was the USS LST-78. One of our anti-aircraft gunners misidentified a PBY as an enemy aircraft and then shot it down. The pilot was fortunately able to crash land the aircraft with no loss of life. Sometime later, the pilot tried to board our ship with a drawn .45 cal. automatic pistol. He wanted to kill the gunner who shot him down! He was restrained and taken away. It is hard to understand how the gunner could make such a mistake, though, because a PBY was one of the most recognizable aircraft ever manufactured! I have great memories of the officers and men aboard ship. 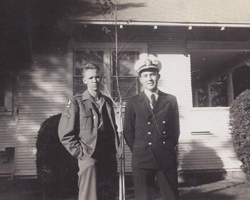 Chief Motor Machinist’s Mate, later Chief Petty Officer James Leach and I were close, and we reconnected many years later via the Ohio LST/Amphibs Association and reminisced about our times together in the Navy during WWII. My brother, Brooks Curlee (at left in photo) and me in Pasadena, CA on Jan. 1, 1946, just before we went to the Rose Bowl. I had just returned from the South Pacific, and was in San Francisco, preparing to assist in the decommissioning of USS LST-78. My brother, who had been wounded and MIA with the 70th Infantry Division (Trailblazers), U.S. Army in Europe, was stationed in southern California. What are the chances that brothers stationed in opposite parts of the world could end up so near each other and go to a football game together! The University of Alabama beat the University of Southern California 34-10. More irony? We both graduated from Auburn! The Asiatic-Pacific Campaign medal with a battle star for the Okinawa Gunto Operation. I was proud to have participated. 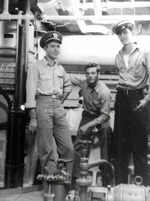 Chief Motor Machinist’s Mate James Leach had the greatest impact on me while I served aboard USS-LST 78. Although I had a mechanical engineering degree and had completed the diesel engineering school, being immediately assigned as the engineering officer of a ship was daunting to say the least. He was an experienced NCO and knew the engine room inside and out. I took care of him (I helped him make Chief Petty Officer) and he took care of me! In the photograph that is me on the left and James Leach on the far right. 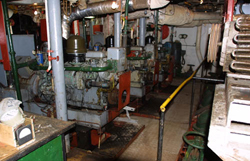 One time the ship’s captain asked to inspect the engine room. He came down and took one look at the auxiliary engines, which apparently was sufficient for him and he left. He never even went into the main engine room! He never came down to the engine room again and we believe he never realized that he had not seen the main engines! The captain also ordered release of the stern anchor much too early during a beaching process. Naturally, all the chain was run out and the anchor was lost. He had to request a replacement anchor much to his embarrassment! I worked my entire civilian career as a sales engineer and a sales manager for two large equipment manufacturing firms. I’ve been retired for many years. 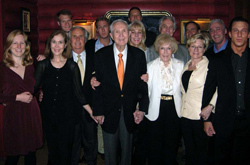 In this photo I am surrounding with my wonderful family on the occasion of my 90th Birthday, March 22, 2012. I learned mostly to be organized and prepared. Preparation and training are the keys for almost any event you may face. Learn everything you can and learn to accept constructive criticism without taking it too personally. I’ve enjoyed reliving my time in the Navy on TWS. It allowed me to put things in perspective chronologically. I’ve also remembered many things I had forgotten until I started writing them down for TWS. Photo is of the Engineering Division aboard USS LST-78, DEC44. I am shown at the far right of the first row.